Anyone who is anyone seems to end up going to Antarctica – its a rite of passage for Kiwi journalists, b-list celebrities and scientists, though the latter tend to have a much more genuine need to venture down there on a regular basis. 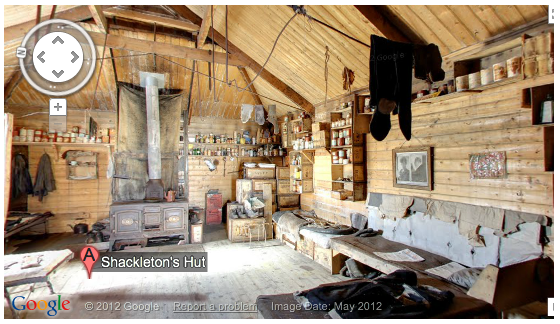 If you yearn to explore Shackleton’s hut or actually stand at the South Pole, don’t fall into one of the above categories and can’t afford to do the trip as a tourist, Google can offer you the next best thing. The search engine giant has upgraded its under-rated World Wonders site, which uses the Google Streetview concept and its Business Photos technology to let people explore heritage sites of significance. The latest batch of high-resolution 360 degree images are from important locations in Antarctica, such as the South Pole Telescope, Shackleton’s hut, Scott’s hut, Cape Royds Adélie Penguin Rookery and the Ceremonial South Pole. The concept is pretty simple. You use your mouse to zoom around and click on the image to progress to another point that has been mapped and imaged, and use your mouse to nosey around a bit more. The quality of the photography is excellent – Google worked with the Polar Geospatial Center at the University of Minnesota and the New Zealand Antarctic Heritage Trust to get the imagery looking good. With this access, schoolchildren as far as Bangalore can count penguin colonies on Snow Hill Island, and geologists in Georgia can trace sedimentary layers in the Dry Valleys from the comfort of their desks. Feel free to leave your boots and mittens behind, and embark on a trip to Antarctica. That is incredible. Particularly the South Pole telescope and the ceremonial South Pole. As one who has always wanted to go there but not likely to get the chance, this will have to do.